Goodbye Fortress of Attitude, Hello Little Gitmo. The four hens in the Fortress of Attitude did something other hens at the Lair have done in the past: They sorted out one of their number for persecution and violence for no apparent reason, though they’ve always previously gotten along fine. What always ends up happening is that the persecuted hen hides in the coop and basically starves herself half to death, and if I let it go too far the other chickens will work on finishing the job. The persecuted hen always turns out to be one that wasn’t laying eggs anyway, so Sunday after Landlady left I took her out of the coop and butchered her for the freezer. Haven’t done that in over a year. The incident settled my mind on something I’ve been procrastinating over: I originally set up two chicken flocks for redundancy, because I fully expected some variety of predator to outwit me at some point. But it’s been going on six years and that never happened. So why even have two flocks? 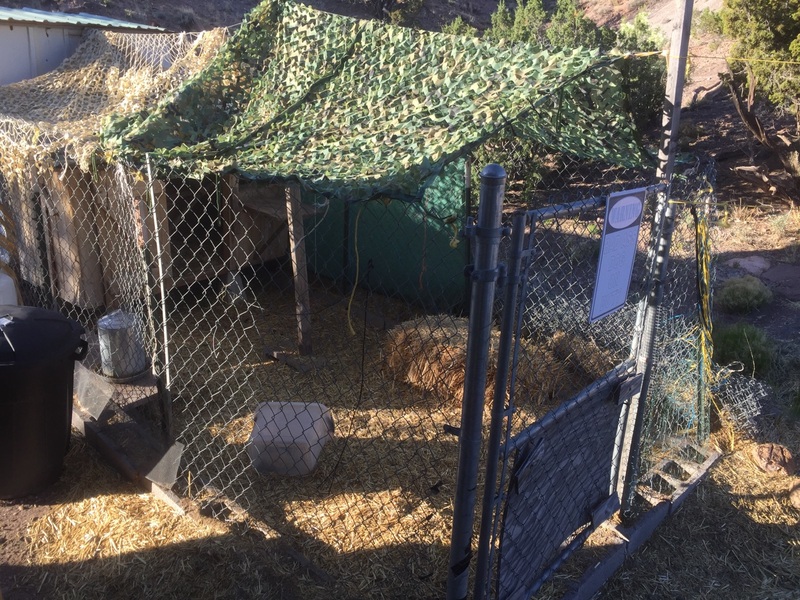 The chickens always seem to do better with a bigger flock in larger quarters, and the Fortress would make a damned good dog kennel should the situation with LB deteriorate as he ages. Last night after they had a nice chance to settle, I went inside and collected the three remaining hens into a cage and drove them to the Big Chickenhouse, where they’ll have to work out their place in the flock’s (literal) pecking order but at least it’ll be three of them and not just one lonely hen. After all this time I’ve pretty much given up learning anything about chicken psychology that would allow me to confidently predict their behavior, but I can’t imagine that three re-introduced hens won’t be safer than one alone. My morning is getting off to kind of a leisurely start, but after breakfast and a walky I’ll hitch up the Jeep trailer and move their pellet barrel, hay bale and other accouterments to their new home. Then as the mood strikes me I’ll clean out the deep litter and work on re-purposing the coop for a dog house, for either Old LB or a theoretical replacement dog. 5 Responses to Goodbye Fortress of Attitude, Hello Little Gitmo. Will Fortress/Gitmo require any serious reinforcement to contain The Bear? Naw. It was built to keep coyotes out. He’s much bigger and stronger than any coyote but was never much of an escape artist even when he was young and feisty. Now he just wants a comfortable nap. Is it worth putting the deep litter somewhere to attempt growing plants in? Oh, I keep it. I was making lasagna soil with it for a while and really did get some garden plants to grow – just big enough for the mice to mow them down. Perhaps it’s time to select a new pup so that LB can help you train his replacement?